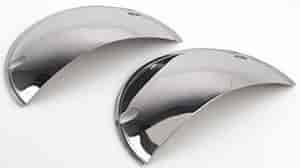 These great looking triple chrome plated headlight half shields give any vehicle that customized appearance of the 50's or the muscle car look of the 60's. Available in four sizes for most round and square headlight systems. They fit most cars and light duty trucks. 2/pkg.